This is a clock I designed and built myself. All of the hardware, software and case. OK the case is just a halloween decoration! Here you can see it in suitably gothic surroundings. 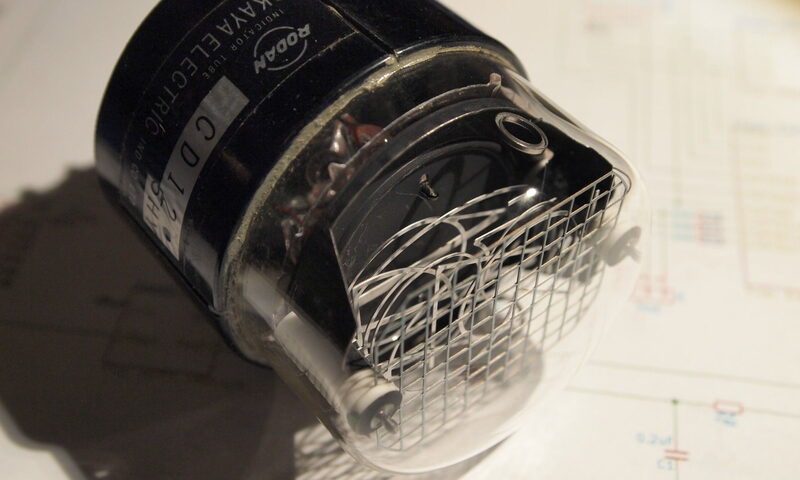 The hardware is later version of my One Tube Clock. I expanded the original design so that it could drive larger tubes like the NL7037 and the ZM568M, but I also added more pins so I could control a B7971 – which is a 15 segment Nixie tube. Then I realized that I could use some of the extra pins to multiplex four regular nixies tubes and still have one left over (10 pins for the digits, 4 to select which tube to show and one more). 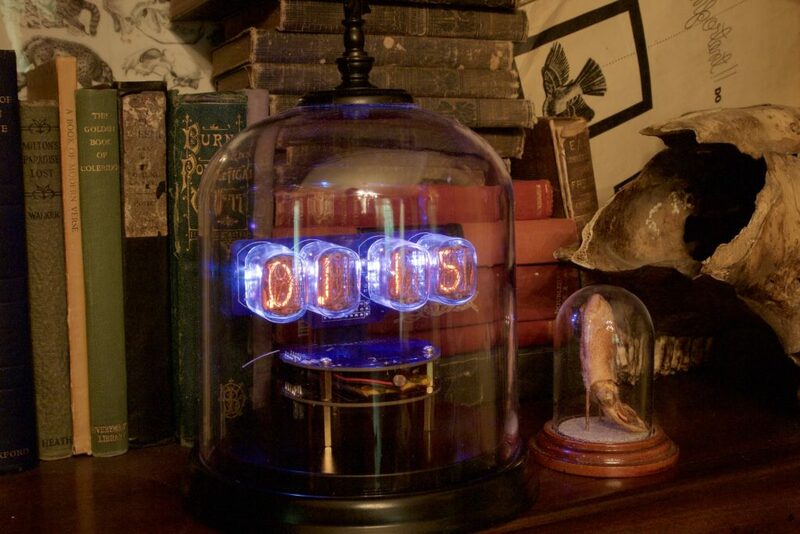 I’ve always wanted to have a clock that used the decimal point found in some tubes, so this is it. It uses IN-12B tubes. The decimal points flash every second and progress from left to right in 15 second intervals (there is a video later), so giving a reasonably good indication of how far through a minute we are. 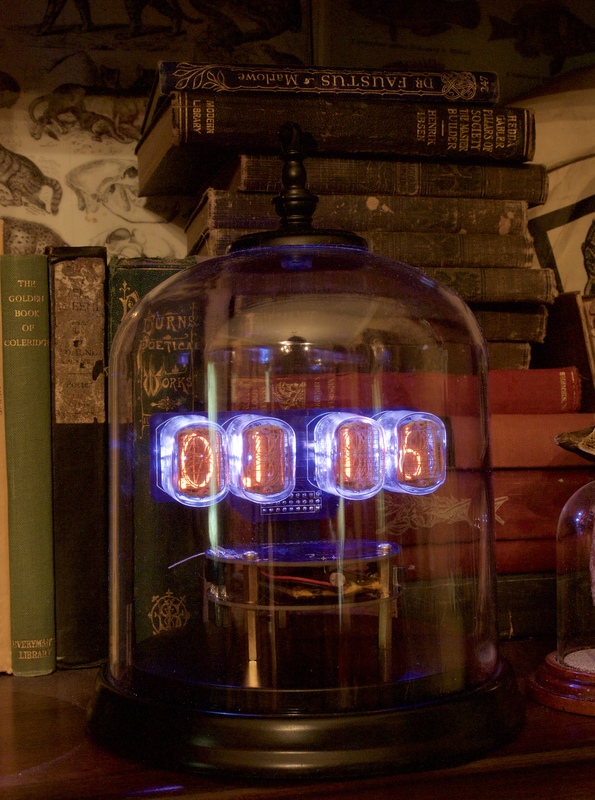 Like the original one-tube-clock, it is based around an ESP8285, so it synchronizes time with the internet and all configuration is done through a web browser. This particular clock uses the expansion header to add a battery ‘shield’. The shield includes a LiPo battery, a load-sharing charger, a 5V boost converter, an IO expander and an accelerometer! The main board has a BQ24392 charger detection chip that detects the presence of a USB connection and how much power it can provide. The software running on the ESP8285 can detect the presence of the shield, so it can change the behavior of the clock to match the power source – adjusting the charge current and enabling power-saving features as necessary. 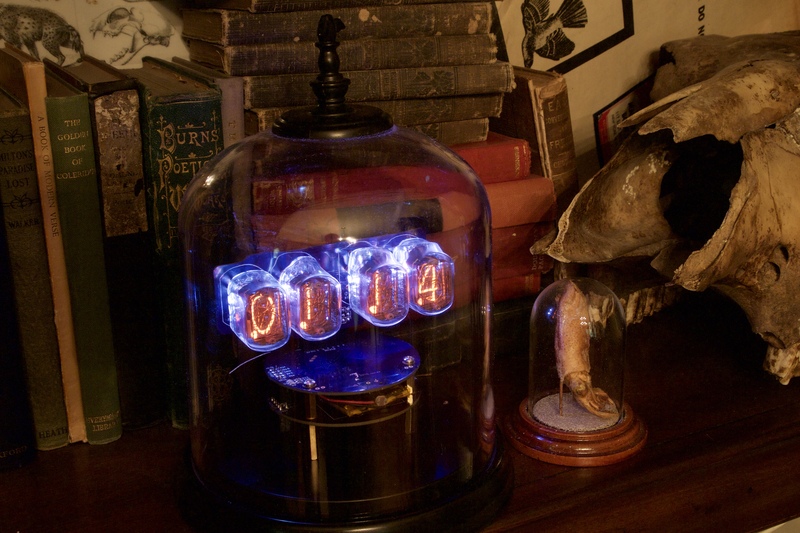 So anyway, here we have a rechargeable, portable, four-tube Nixie clock in a gothic case. Why? I used it as a prop at a burlesque show – A Dark Knight in the Asylum – which was Batman/Gotham themed – I went as the Clock King. It now serves as my bed-side clock (it has a light sensor too, so it dims appropriately).